It’s been awhile since I’ve shared a recipe. With so many awesome food blogs out there I don’t have much to contribute. But once in awhile I make something that makes me so happy I need to share, and tonight, it’s Portobello Spinach Frittata. The original recipe is from Taste of Home magazine, but I’ve modified it so much that – to use a hair metaphor – mine looks more like a curly blond than a straight-haired brunette. But still, kudos to TOH (one of my favorite recipe sites). I’d not have made this without the original. 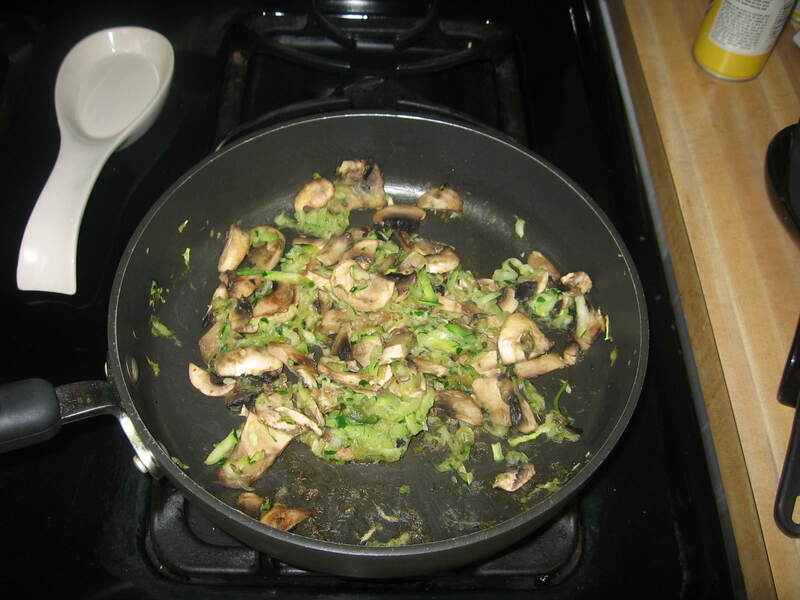 In a large frying pan coated with cooking spray, sauté the mushrooms and zucchini (with a little garlic, if you’d like) until they are soft and there’s no more liquid left in the pan. 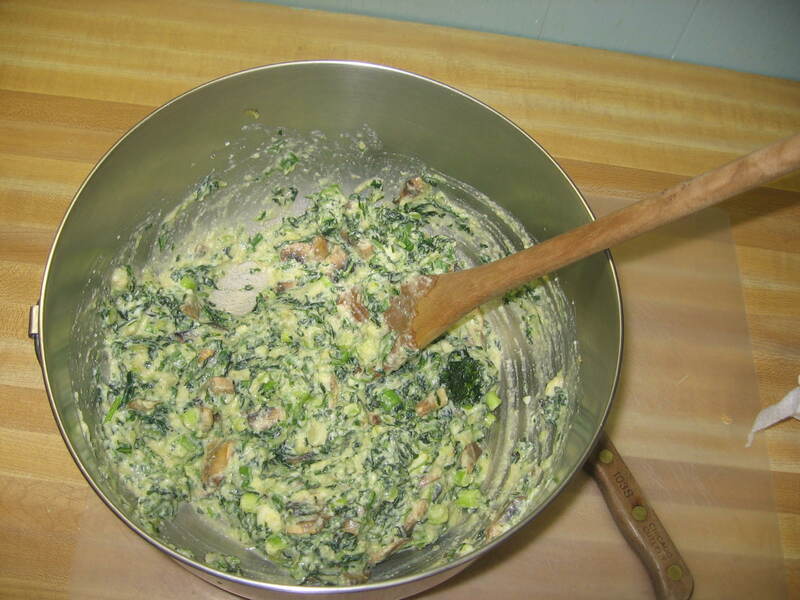 In a large bowl, combine the first six ingredients. Add the cooked mushrooms and zucchini and basil or other spices. Mix well. Transfer to a 9-inch pie plate coated with cooking spray. Bake at 350 degrees for 30-35 minutes or until a knife inserted near the center comes out clean. Let stand 10 minutes before cutting. This makes 4-6 servings. Two in my house some nights. If you’re counting Points, it’s 4 for 4 servings made this way. Do I look tired? Because I am. 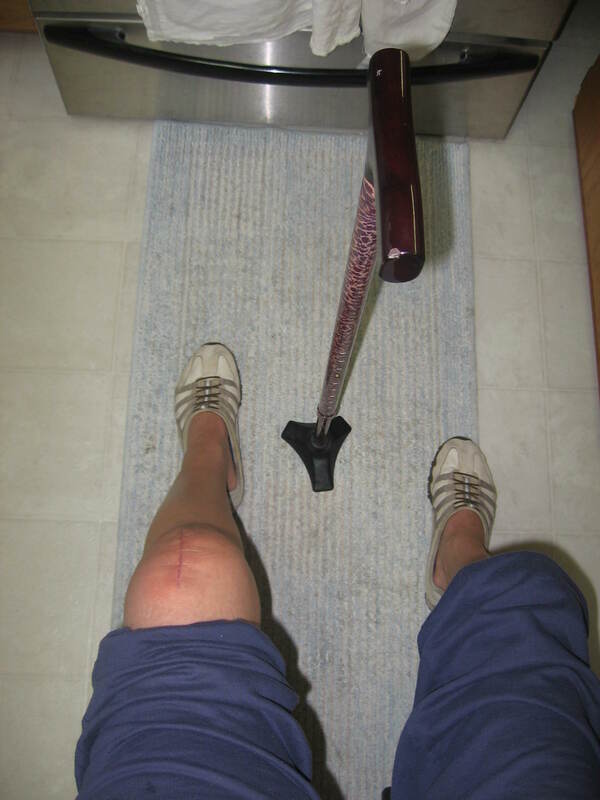 My knee and cane waiting. Remember, recipes aren’t sacred! If you don’t follow them to a T it’s not like you’ll go to hell or anything. 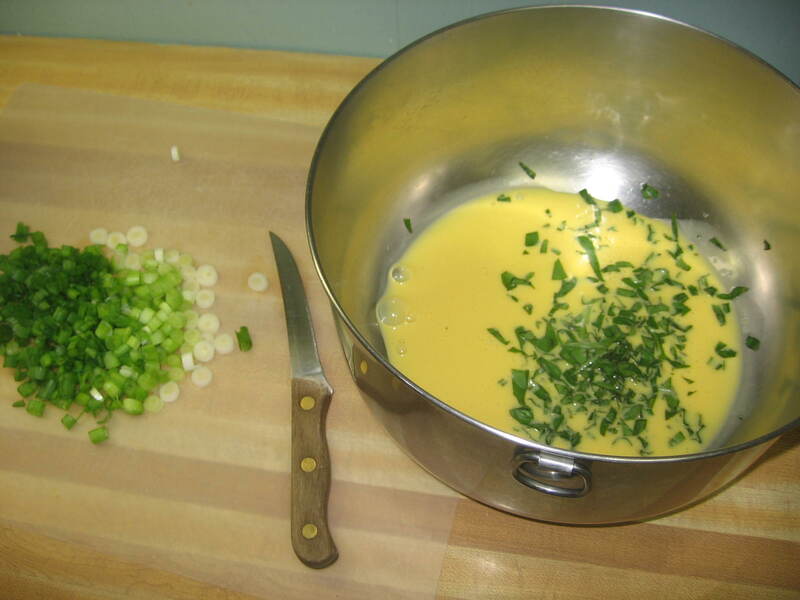 How do you tweak your favorite recipes to suit you and your taste/dietary wants and needs? Do you look at a recipe and know you can make it healthier or better? This entry was posted in Uncategorized on July 27, 2010 by Lynn Haraldson. I have the worst time following a recipe to the letter. I always have to tweak it. That said, this looks like a fantastic recipe makeover! I love a good frittata. My new favorite recipe site is askGeorgie.com. She's got a lot of good recipes, and very healthy. Lots of veggie recipes, too! I'm particularly partial to her crunch roasted garbanzo bean recipe. 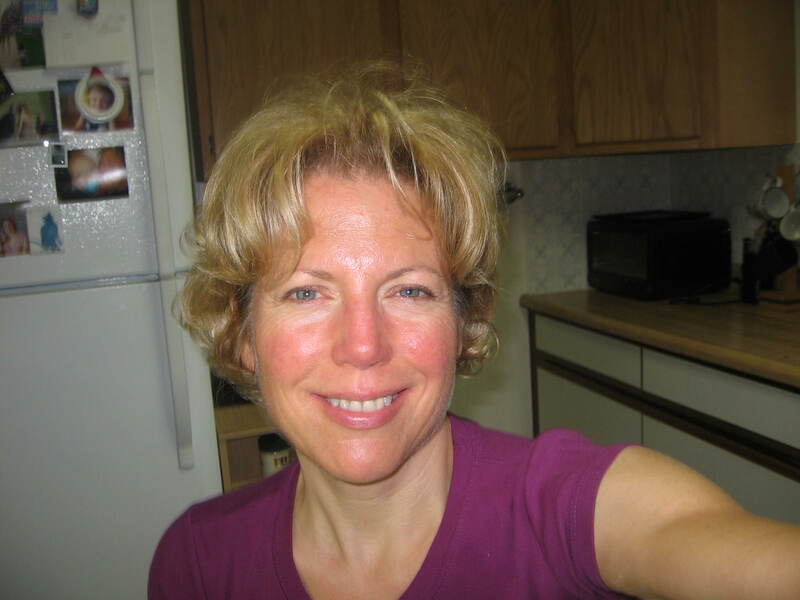 Pubsgal, thanks for turning me on to askgeorgie.com! From there I found the Nutrition Blog Network and another blog called sideofsneakers.com that had what looks like an awesome vegetarian sloppy joe recipe. I did all this by 5:30 a.m.! Debby, I love pine nuts. I think I'll crush a few on the bottom next time. Thanks! I love all of the healthy food blogs out there and find it very easy to tweak the recipes. Typically I am always trying to lower the fat and many times if you cut the fat ingredient in half or make a substitution it comes out fine. 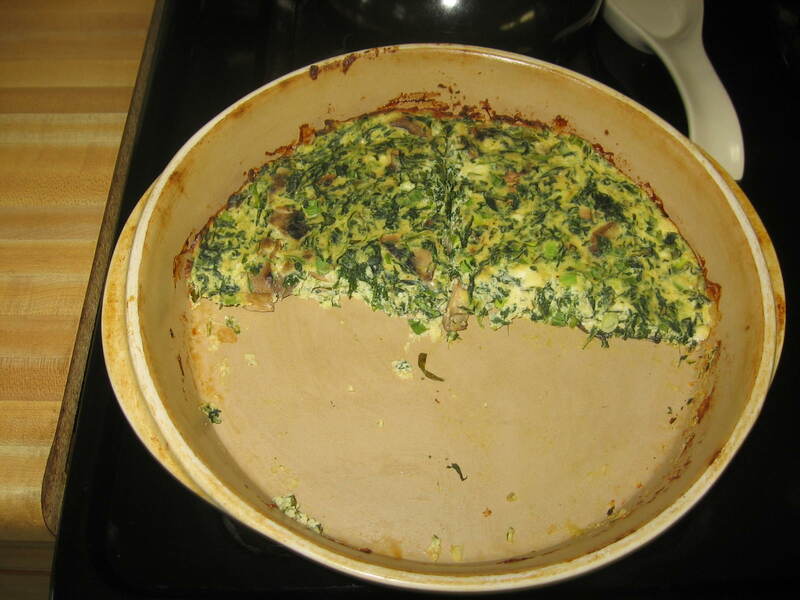 Thank you for sharing your frittata recipe. As much as I love my collection of cookbooks and still purchase from time to time, I have pages and pages of printed recipes from the blogs and ripped magazine recipes. I try to comment on the printed recipes once I get my family reviews along with my tweaking because seldom do I have a weekly or monthly 'rotation'. When o when to find or make the time to organize all these recipes is my challenge?! This looks yummy. As a pine nut lover, I'd suggest sprinkling them on the top, rather than the bottom. They'll stay more crunchy rather than get soggy–maybe even just add toasted nuts at the end.